Aim: This study was undertaken to investigate the physicochemical properties of modified low density lipoprotein (LDL) in diabetes. Methods: LDL from 10 type 1 and 10 type 2 diabetic patients, as well as LDL from 10 non-diabetic subjects, was subdivided into bound and non-bound fractions by affinity chromatography on Ricinus communis agglutinin-agarose, and further characterized by sialic acid content, hydrated density, electrophoretic mobility, and the ability to induce cholesterol deposition in cultured cells. 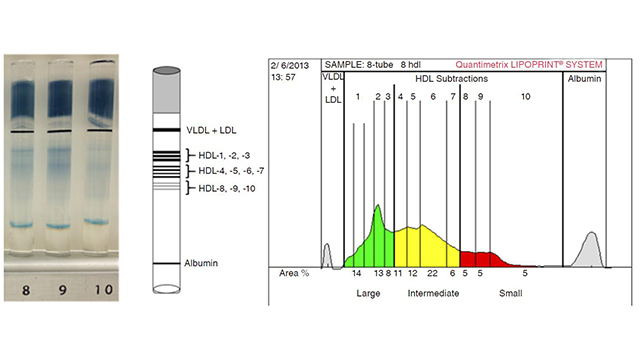 Results: The non-bound LDL fraction was similar to native LDL from healthy subjects, with respect to its physicochemical properties, and did not produce intracellular cholesterol accumulation. The bound LDL fraction was characterized by several alterations differentiating it from non-bound LDL, namely, significantly lowered sialic acid content (by 35-50%, compared with non-bound LDL), increased electrophoretic mobility (by 40-50%), increased hydrated density (difference in modae, 5.6-5.9 mg/mL), and smaller particle size (difference in modae, 3.8-4.9 nm). 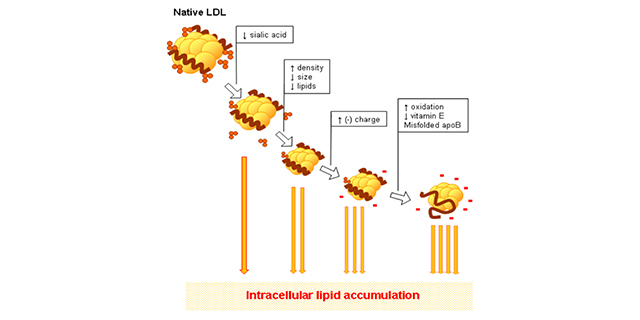 Bound LDL possessed the ability to induce a 2.1- to 2.7-fold increase in intracellular cholesterol content. Conclusion: The results showed the presence of a dense, small, more electronegative, desialylated LDL subfraction in the blood of diabetic patients, which is in vivo modified atherogenic LDL. Given the notorious impact of cardiovascular disease (CVD) as the current leading cause of mortality worldwide, the prevention, identification and management of CV risk factors represents a priority in daily clinical practice. Several studies have shown the beneficial effects of dietary omega-3 polyunsaturated fatty acids (PUFAs) on CV health. 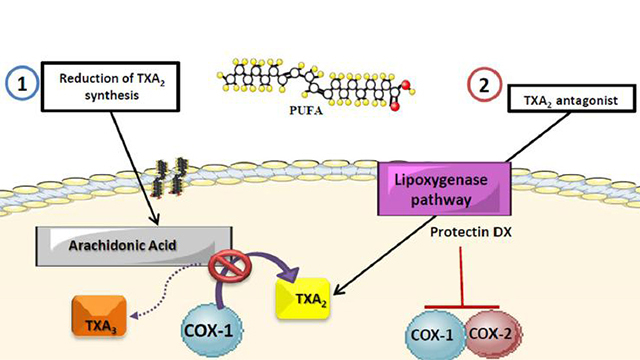 Their derivatives, eicosapentaenoic acid and docosahexaenoic acid, intervene in multiple metabolic pathways, including: regulation of the inflammatory response, by reducing the synthesis of pro-inflammatory cytokines; regulation of platelet aggregation, activation and adhesion, by modulating thromboxane A2 and plasminogen activator inhibitor-1 activity; regulation of the coagulation pathways, by reducing the carboxylation of vitamin K-dependent coagulation factors; improvement of endothelial function, given their effects on prostaglandin synthesis and endothelial nitric oxide synthase; reduction of serum lipids, through their effects on the hepatic synthesis of triacylglycerides, beta-oxidation of fatty acids and lipoprotein catabolism; and improvement of myocardial function via their membrane-stabilizing effects, and an increase in fluidity, size and distribution of membrane lipid rafts. Nevertheless, these effects appear to vary according to the type of PUFA ingested, dietary sources, daily dosing and individual factors inherent to the subject. Therefore, further studies are required to determine the ideal supplementation for each kind of patient and their particular CV profiles. Cardiac muscle contraction is a strictly regulated process which conjugates a series of electrophysiological, biochemical and mechanic events, resulting in the pumping of blood to all bodily tissues. These phenomena require a very high energetic demand both for generating the necessary mechanical force, and for maintaining cellular homeostasis during the process. In the myocardium, fatty acids (FA) represent the main energy substrate, although other secondary substrates, such as glucose and ketone bodies, may also be used. 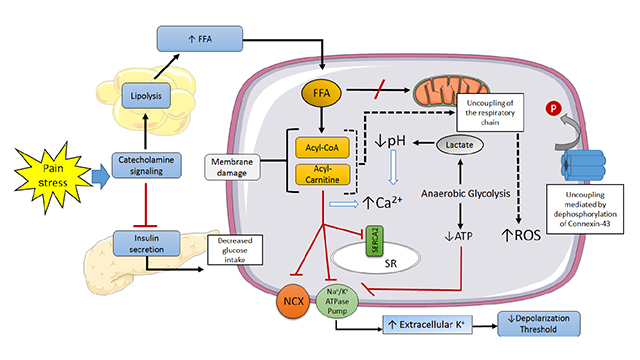 Nevertheless, under certain conditions such as heart failure or myocardial ischemia, FA metabolism may become deleterious via mechanisms such as oxidative stress and arrhythmogenesis. In an ischemic milieu, various metabolic changes occur as a consequence of hypoxia, favoring cell necrosis, ventricular arrhythmias, and death. Major events in this context include an increase in extracellular K+, a decrease in pH, and accumulation of intracellular calcium. This review includes a detailed description of the molecular basis underlying myocardial contraction and energetic metabolism in cardiomyocytes, aiming to promote an integral understanding of the pathophysiology of heart ischemia. 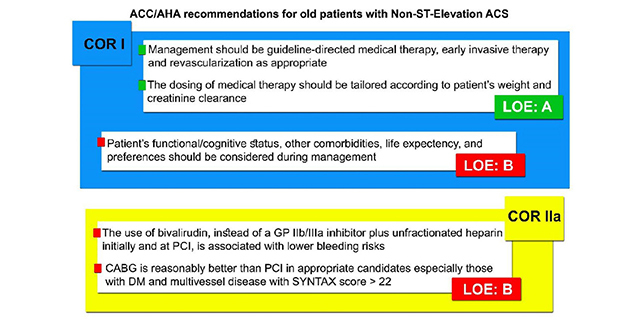 This in turn may aid in the development of future, more satisfactory alternative treatments in the management of acute coronary ischemia episodes. Leriche’s syndrome is an aortic occlusive disease, which is due to obliteration of distal aorta above the site of bifurcation of common iliac arteries. The classic triad of symptoms include claudication, impotence, and absent or decreased femoral pulses. It may be acute or chronic in onset. Most of the cases are chronic in nature due to baseline pathophysiology involving atherosclerotic changes in the aorta. 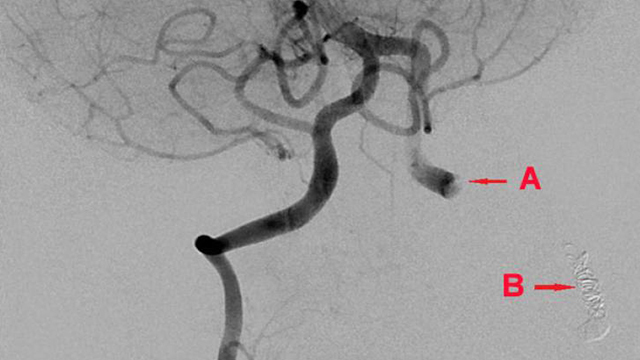 There are many causes of acute leriche’s syndrome like surgical manipulation, trauma, thromboembolic disease, hypercoagulability, atrial fibrillation, neoplasm, intraplaque hemorrhage in an aneurysm. Post-surgical Leriche’s syndrome is rare and needs a strong index of suspicion to diagnose. The authors highlight a case of Leriche’s syndrome, as a post-surgical complication and its clinical importance. This study presents the case of a female patient with severe heterozygous familial hypercholesterolemia. 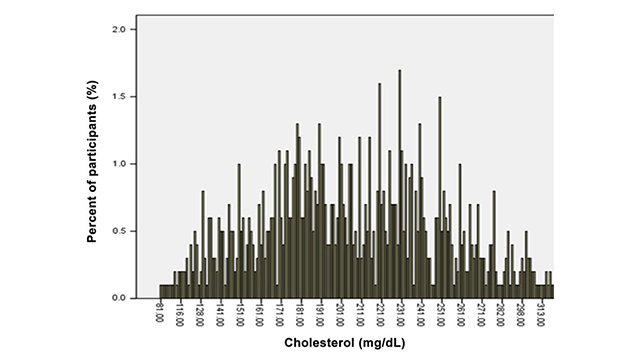 Despite the combined maximum dose oral treatment with rosuvastatin and ezetimibe, we found markedly elevated lipid parameters. Therefore, we indicated monthly selective low density lipoprotein (LDL) apheresis treatment using the Direct Adsorption of Lipoproteins system. 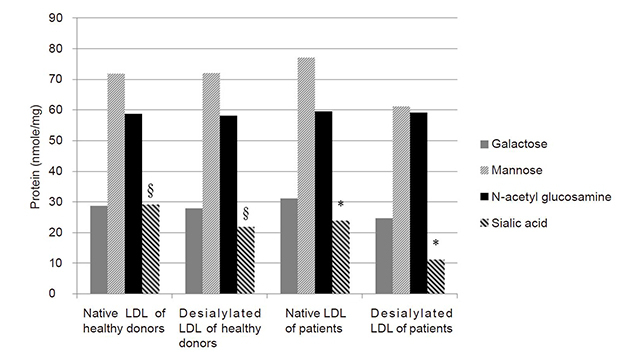 After more than 2 years the lipid levels of the patients were still above the therapeutic goals. Finally, we completed the treatment by the inhibitor evolocumab biweekly. 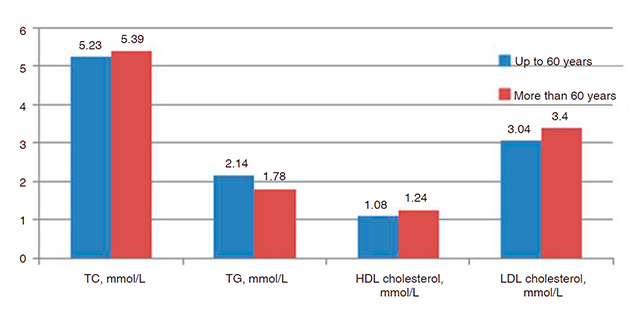 Further LDL cholesterol (LDL-C) reduction was achieved resulting in lipid parameters on goals. However, administration of evolocumab without LDL apheresis could not reduce the LDL-C below 2.5 mmol/L. 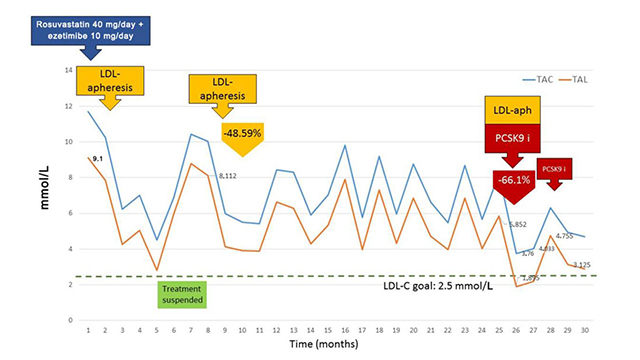 We concluded that both LDL apheresis and proprotein convertase subtilisin/kexin type 9 (PCSK9) inhibitor treatments were effective and well tolerated. None of them alone would be enough to achieve lipid goals in this patient. However, the combination of these potent treatments may normalize the lipid levels and prevent cardiovascular complications. Acute coronary syndrome (ACS) comprises a spectrum of disease that includes unstable angina, non-ST-elevation myocardial infarction, and ST-elevation myocardial infarction. Clinical management of patients with ACS has greatly evolved over the last two decades, but ACS remains an important cause of morbidity and mortality in patients with coronary artery disease. This narrative review describes the indication, timing, and approaches to surgical revascularization in the context of ACS. In particular, the review discusses and compares the utilization of off-pump coronary artery bypass grafting (CABG) vs. conventional on-pump CABG. Other surgical interventions, such as totally endoscopic coronary artery bypass and hybrid coronary revascularization, are also reviewed. Depression is one of the most common psychiatric disorders, and has become an epidemic in modern medical practice; notorious for frequently co-occurring with multiple comorbidities, especially cardiovascular disease (CVD), type 2 diabetes mellitus (DM2), and its various risk factors comprised in the metabolic syndrome (MS). Selective serotonin reuptake inhibitors (SSRIs) are the most widely used class of psychotropic drugs in this and many other clinical scenarios; yet their impact on cardiometabolic health has not been elucidated. 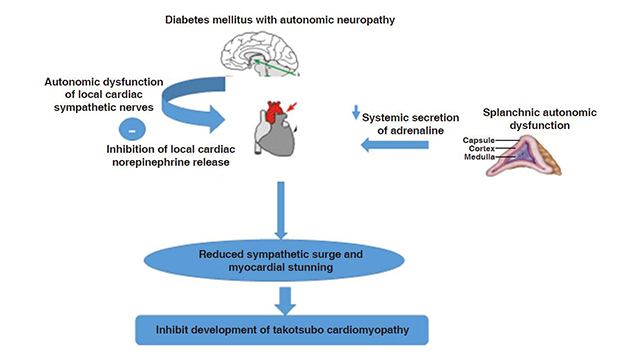 The objective of this review was to summarize current views on the pharmacology of SSRIs and cardiometabolic risk, as well as available epidemiological evidence regarding its clinical significance. SSRIs appear to intervene in cardiometabolic physiology fundamentally by modulating chronic inflammation, a key pathophysiologic phenomenon in MS, DM2 and CVD. However, the dosing necessary to achieve a beneficial impact in this regard, as well as their clinical correlations, remain controversial. Each SSRI displays a particular profile regarding each of the components of the MS: weight gain seems to be the most common effect of SSRIs, more frequent with paroxetine, followed by citalopram and escitalopram. As a drug class, SSRIs also appear to promote hypercholesterolemia rather uniformly, while fluoxetine and citalopram appear to particularly increase triacylglyceride levels. In contrast, fluvoxamine and paroxetine seem to have the greatest impact on dysglycemia. Lastly, most SSRIs appear to be innocuous or even beneficial regarding blood pressure and high-density lipoprotein cholesterol. Nevertheless, many of these effects may vary significantly upon specific clinical circumstances, especially timing. This topic remains rather unexplored in clinical psychopharmacology, and further, larger-scale epidemiological studies are needed in order to offer improved care in this field. 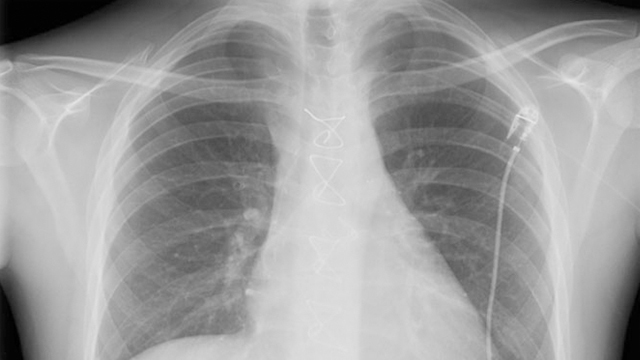 Sternal non-union is a rare but serious complication post-sternotomy. It is defined as sternal pain with clicking, instability, or both for more than 6 months in the absence of infection and usually presents in an outpatient setting. It may result in multiple admissions to the hospital for surgical debridement and wound care therapies. Several risk factors have been identified in the literature but treatment options are limited. 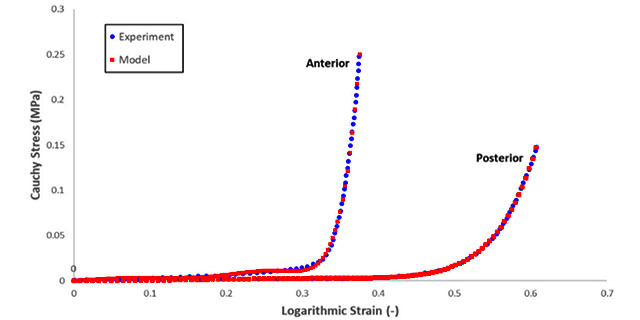 Proven benefits of increased stability and decreased incidence of non-union using the principles of rigid fixation have been described in other surgical specialties such as orthopaedic surgery. Employing this, the authors describe the first successful sternal non-union fixation using the Titanium Sternal Fixation System (DepuySynthes) in Scotland. Descending thoracic aortic aneurysm management has gained momentum and became a topic of many debates at international levels since the evolution of endovascular repair. Ruptured descending thoracic aortic aneurysm is a clinical emergency which is associated with high mortality and morbidity rates if not managed properly. Prior to thoracic endovascular aortic repair (TEVAR), open repair (OR) was the gold standard management, however since the evolution of TEVAR, this has changed. Several centers have reported many of their experiences and published that TEVAR can provide equal or even better perioperative outcomes when compared to OR, although the evidences can be of only short term and could be biased at different levels at the time of publication. This review article is aimed to examine current literature evidences behind the use of TEVAR vs. OR and the reported comparative clinical outcomes. Aim: Endarterectomy has been shown to be an effective adjunct in treating diffusely diseased coronary arteries. Reconstruction of endarterectomized coronaries has been done by various techniques. We compare early results of left internal mammary artery (LIMA) patch to saphenous vein patch in left anterior descending artery (LAD) reconstruction. Methods: We prospectively followed 30 patients with diffusely diseased LAD from January 2016 to January 2018. Patients were followed up clinically, by echocardiogram and CT coronary angiography. Results: Twenty-seven patients were males (90%). The mean age was 59.23 ± 7.98. Twenty-two patients (73.3%) had a LIMA onlay patch. The mean length of patch reconstruction was greater in the saphenous vein group than LIMA group (8.31 ± 1.16 cm vs. 5.64 ± 0.73 cm, P < 0.001). Postoperative myocardial infarction occurred in 1 patient from the LIMA group (4.5%) and 1 patient in the saphenous vein patch group (12.5%). Operative mortality occurred in 1 patient belonging to the LIMA group. Mean time of follow up was 17.59 ± 6.34 months. CT coronary angiography showed a patency rate of 93.1%. Conclusion: Results of reconstruction by LIMA and saphenous vein patch are comparable in short-term follow up. Aim: To evaluate whether postoperative malperfusion (PM) affected in-hospital and long-term survival in acute type A aortic dissection (AAAD) surgical patients and to identify risk factors for PM. Methods: Patients who underwent AAAD surgery at a single institution between January 2005 and March 2015 were retrospectively analyzed. Results: Two-hundred fourteen patients with complete data were identified. At presentation, 119 patients (55.6%) showed preoperative malperfusions: 68 (31.8%) were cerebral, 38 (17.7%) were renal, and 13 (6.1%) were mesenteric. PM was found in 55 patients (25.7%). In-hospital mortality was 47.3% (26/55) vs. 22.6% (36/159) in PM and non-PM patients, respectively (P < 0.0001). 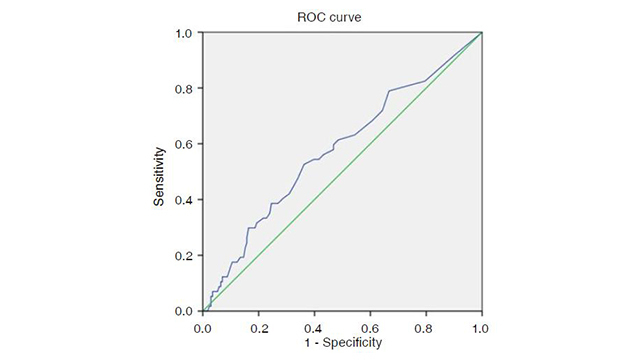 Independent predictors for in-hospital mortality included being 75 years or older [odds ratio (OR): 1.1, 95% confidence interval (CI): 1.03-1.13, P < 0.001] and having renal PM (OR: 53.5, 95% CI: 3.97-721.3, P < 0.01). 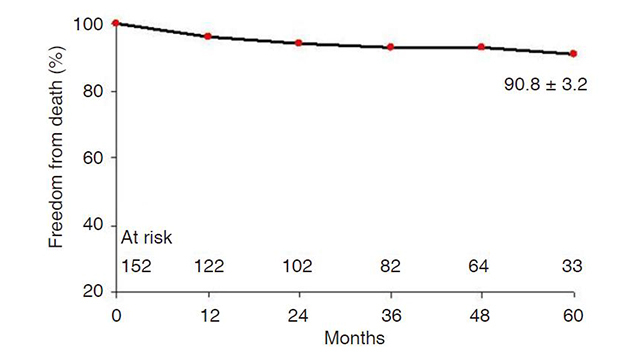 Five-year survival was 78.6 ± 7.8% vs. 93.9 ± 3.4% in PM and non-PM patients, respectively (P < 0.001). Independent predictors for long-term survival were being at least 75 years old (OR: 3.7, 95% CI: 0.9-14.0, P = 0.05) and having renal PM (OR: 28.6, 95% CI: 1.8-462.0, P = 0.01). PM and intimal tears distal to the ascending aorta or the proximal aortic arch were also risk factors. Conclusion: PM, especially with renal involvement, is associated with in-hospital mortality and reduced long-term survival. AAAD surgeries reduced preoperative malperfusions. Sites of cannulation and interventions requiring circulatory arrest during cardiopulmonary bypass were not predictors of PM. 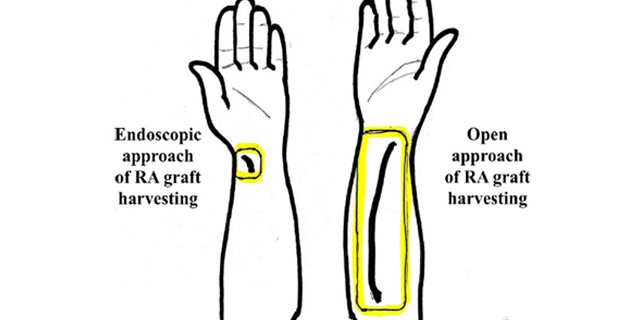 This article summarizes the current research on endoscopic technique of radial artery harvesting as a graft for coronary artery bypass grafting (CABG) surgery. 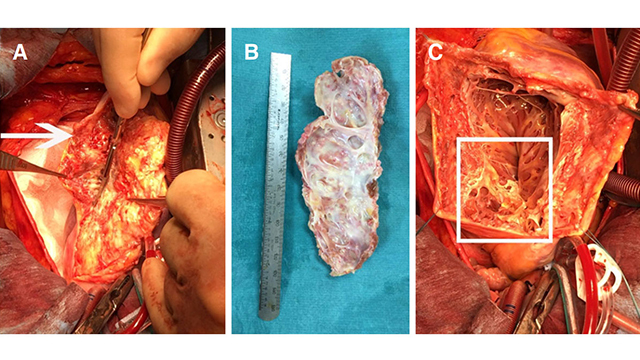 Based on the available data, we reviewed various grafts available for CABG. Radial artery as a graft in CABG surgery has recently gained popularity. We sought to investigate the impact of radial artery harvesting techniques on clinical outcomes. Endoscopic harvest approach was found to be feasible in all patients when performed by skillful surgeon while local arm complications were found to be infrequent. However, when compared to open approach for harvest, it takes longer but provides higher patient satisfaction and cosmetic result. Aim: To study heart and vascular remodeling in essential hypertension (EH) and concomitant type 2 diabetes mellitus (DM2) with respect to genetic polymorphism of the angiotensin II receptor type 1 (AGTR1) gene and peroxisome proliferator-activated receptor-γ2 (PPARγ2). Methods: Biochemical blood analysis, echocardiographic evaluation of mitral diastolic blood flow and tissue Doppler spectral modes, reactive hyperemia, color Doppler mapping. Results: Patients with A/C and C/C genotypes of the AGTR1 gene had higher blood pressure, more pronounced metabolic disorders, a larger left ventricle (LV), higher myocardial mass index left ventricle, and a greater intima media thickness (IMT), with a lower rate of endothelium-dependent vasodilation (EDVD) compared to the A/A genotype. Patients with the Pro/Pro genotype of PPARγ2 had higher levels of blood pressure, larger LVs, greater IMT, pulse wave velocity, and a lower rate of EDVD compared to the Pro/Ala and Ala/Ala genotypes. Patients with the Pro/Pro genotype had significantly more pronounced dyslipidemia and insulin resistance than patients with other PPARγ2 genotypes. Conclusion: The polymorphism of genetic markers AGTR1 and PPARγ2 in patients with EH and concomitant DM2 was associated with the development of comorbidity. 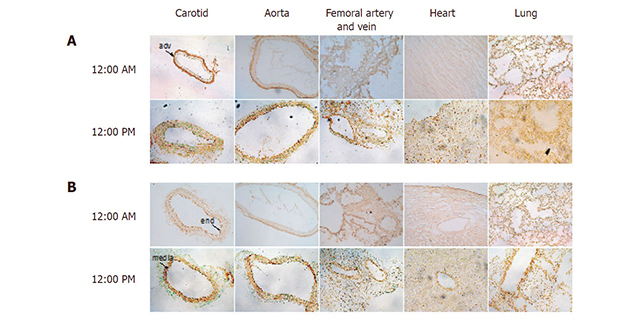 Different genotypes of specific genes alter the severity of cardiovascular remodeling and metabolic disorders. Pulmonary artery injury (PAI) is rare, lethal clinical entity. Traumatic PAI is anatomically classified into transection/rupture/laceration, pseudoaneurysm, dissection and fistula. In addition, traumatic PAI is clinically classified into two major categories: iatrogenic and non-iatrogenic, depending on the mechanism of the trauma. The frequency, clinical symptoms and treatment differ between the two clinical categories. If PAI can be managed appropriately and promptly in patients without cardiac arrest, the patient may be saved, as PAI can be easily controlled with appropriate procedures due to the low pressure in the PA circulation. Bioresorbable stents (BRSs) are regarded as the next-generation medical devices to treat blocked or diseased arteries. The use of BRSs aims to reduce the risk of late stent thrombosis and long-term tissue inflammation associated with permanent metallic stents. BRSs are designed to relieve symptoms immediately and also provide mechanical support for an appropriate time period before they are fully absorbed by human body. To promote clinical adoption of BRSs or even to substitute metallic stents, the mechanical performance of BRSs needs to be thoroughly investigated and quantitatively characterised, especially over the full period of degradation. This paper offers a review of current research status of polymeric BRSs, covering both experimental and modelling work. 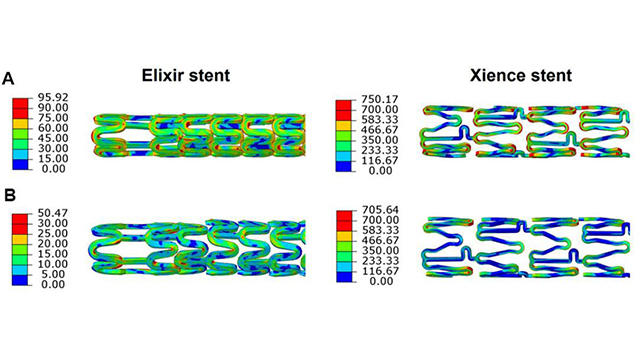 Review of experimental studies highlighted the effects of stent designs and materials on the behaviour of polymeric BRSs. Computational work was able to simulate crimping, expansion and degradation of polymeric BRSs and the results were useful for performance assessment. In summary, the development of polymeric BRSs is still at an early stage, and further research is urgently required for a better understanding and control of their mechanical performance. Aim: D-dimer reportedly plays a leading role in diagnosing pulmonary embolism. Additionally, homocysteine is an established risk factor for atherosclerosis, vascular disease, and thrombosis. Herein, the authors aimed to evaluate the diagnostic significance of D-dimer and homocysteine levels, together with multi-detector computed tomography (CT) in suspected pulmonary embolism. Methods: The authors examined patients suffering from conditions and complaints that are typical of pulmonary artery thromboembolism (PATE), such as chest pain, haemoptysis, dyspnoea, tachycardia, arterial hypotension, and signs of vein thrombosis in the inferior limbs. 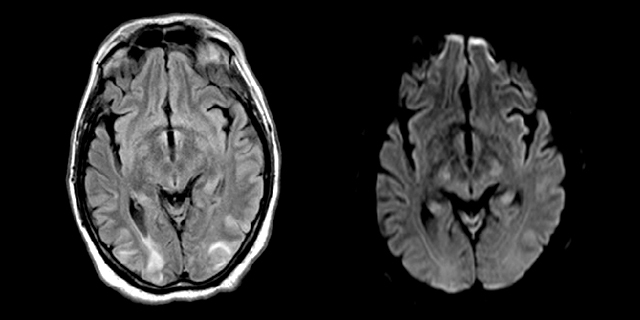 In these patients, PATE was found in different localizations with varying rates of severity. D-dimer levels were measured in patients with suspected PATE using enzyme-linked immunosorbent assays. Homocysteine levels were determined by an enzymatic method. 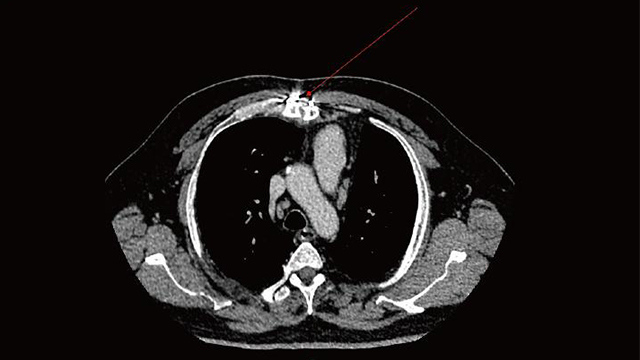 All patients were examined to evaluate the presence of pulmonary embolism by multi-detector CT angiopulmonography. Results: Changes in homocysteine levels can be considered a separate independent factor for PATE diagnostics. The correlation between multi-detector CT angiopulmonography, elevated D-dimer levels, and concomitant hyperhomocysteinemia can be used not only for diagnostics but also for the assessment of the effectiveness of PATE treatment. Conclusion: Multi-detector CT angiopulmonography, D-dimer levels and related hyperhomocysteinemia can serve as significant laboratory markers in the diagnosis and treatment efficacy of PATE. Increasing evidence indicates that adipose tissue-originated cytokines mediate communication between obesity-related exogenous molecules and the molecular events that initiate the metabolic syndrome and the inflammatory responses in the cardiovascular system (CVS). 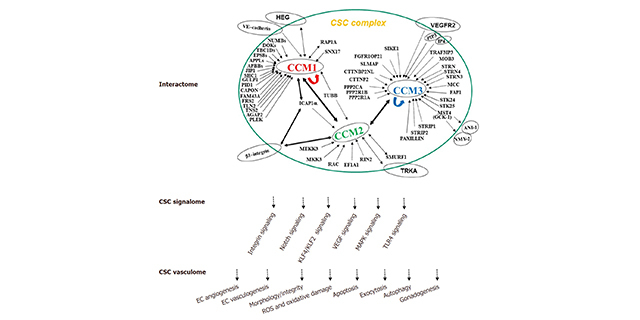 Adipose tissue-derived cytokines including the C1q/tumor necrosis factor-related proteins (CTRPs), a 15-member family of novel adipokines, has attracted much interest due to its metabolic regulatory and anti-inflammatory effect and appear to play a pathophysiological role in metabolism and immunity. 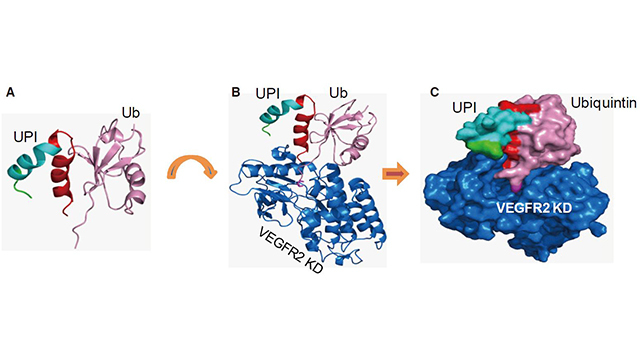 To date, 15 members of CTRP family have been identified and they also play a role in the CVS, especially as potent biomarkers or therapeutic targets for modulating metabolic or inflammatory functions. 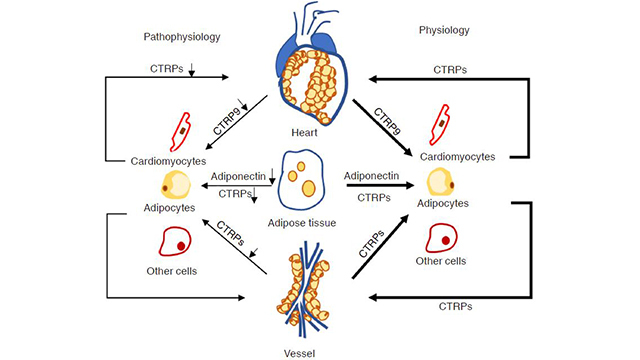 Therefore, this review will focus on the characteristics of CTRPs that influence cardiovascular function and on the potential of CTRPs as biomarkers and therapeutic targets. Aim: To determine the impact of galectin-3 levels on the progression of metabolic disorders and structural-functional changes in the myocardium and blood vessels in patients with concomitant systemic arterial hypertension (AH) and type 2 diabetes mellitus (type 2 DM). Methods: Ninety-five patients with hypertension stage II grade 2 (53 males and 42 females) were examined. The patients were separated: group 1 (n = 32) patients with AH, without carbohydrate metabolism disorders; group 2 (n = 30) patients with AH and pre-diabetes; group 3 (n = 33) concomitant AH and type 2 DM. 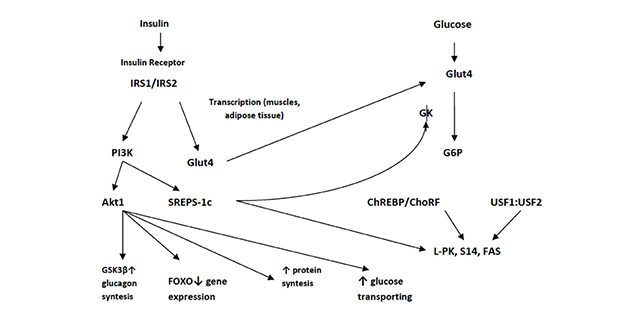 Carbohydrate metabolism, insulin resistance parameters and galectin-3 levels were measured. Echocardiography was performed to determine the structural-functional condition of the heart. Estimation of the intima-media complex thickness of the common carotid artery was performed by duplex ultrasound scanning. Results: Hypertrophy of the left ventricular myocardium is most evident in patients with AH and type 2 DM compared with groups 1 and 2, and the control group (P < 0.05). 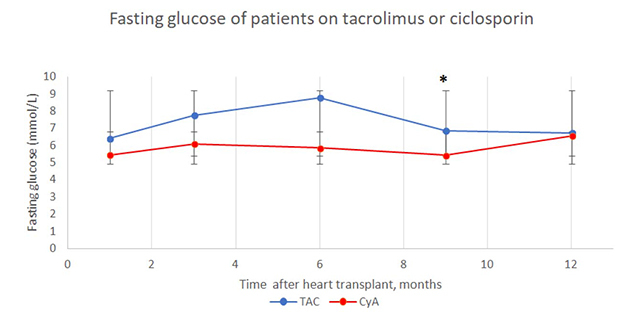 The levels of galectin-3 in the group with concomitant hypertension and type 2 DM were higher than in groups 1 and 2, and the control group (P < 0.05). A positive correlation was revealed between the level of galectin-3, indices of insulin resistance, and structural-functional cardiac and vessel remodeling. Conclusion: Galectin-3 levels in serum are significantly linked with indices of insulin resistance and cardiovascular remodeling. Takotsubo cardiomyopathy (TC) is a syndrome that predominantly affects postmenopausal women and is characterized by transient regional systolic dysfunction of the left ventricle which occurs in the absence of angiographic evidence of significant obstructive coronary artery disease. It is often but not always triggered by emotional or physical stressful stimuli. In most cases, the regional ventricular dysfunction extends beyond a single epicardial coronary artery territory. It typically involves the apex, with rare atypical presentations involving the base and right ventricle. Although the pathophysiological underpinnings of TC have not been completely elucidated, possible mechanisms include catecholamine overactivity, diffuse multivessel coronary spasm, microvascular dysfunction and estrogen deficiency. The prevalence of diabetes mellitus has been noted to be low in multiple studies of patients with TC. 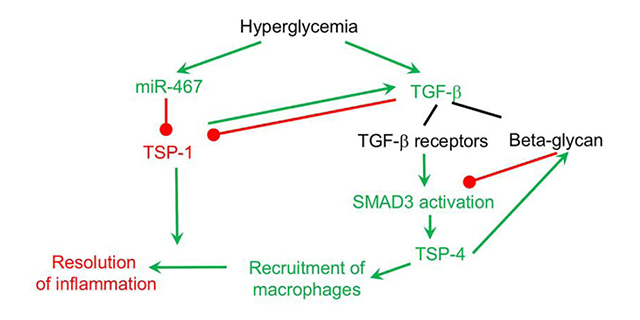 In this review, the authors discuss the association between diabetes mellitus and TC, with a special emphasis on the possible protective effect of diabetes mellitus in development of TC. Myocardial protection is integral to the functioning of hearts in day to day cardiac surgery. 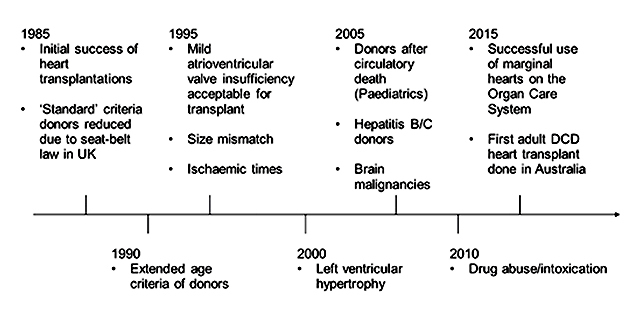 However, due to the longer ischaemic times, it becomes pivotal in the management of organs during transplantation. There are many different strategies employed to ensure diligent and judicious myocardial protection during donor management, transportation of the heart and the post-operative period. Given the limited supply of organs and the increasing waiting lists for heart transplants worldwide, it has become an area of renewed interest with many innovations and inventions using the principles of basic sciences to improve outcomes of transplanted hearts. The heart procurement process encompasses several of the different myocardial protection strategies in tandem to provide the greatest benefit to the recipients. This review looks at the different modalities employed, which include different types of cardioplegia, the role of biomarkers, the cutting-edge novel therapies, hormonal therapies and ischaemic conditioning strategies. 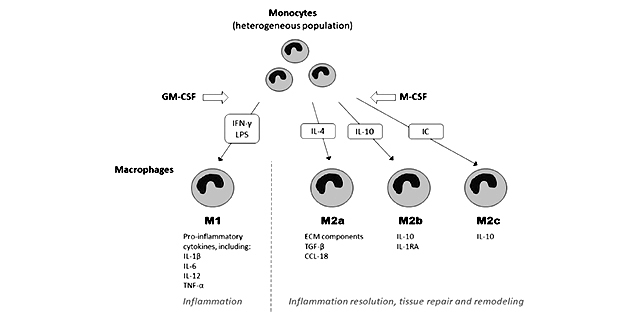 Aim: Mast cells are versatile innate immune cells and are reported to promote vascular inflammation and neointimal lesion formation, thereby contributing to the development of vascular stenosis and atherosclerosis. However, it is not clear whether mast cells also regulate vascular matrix remodelling in established neointima. 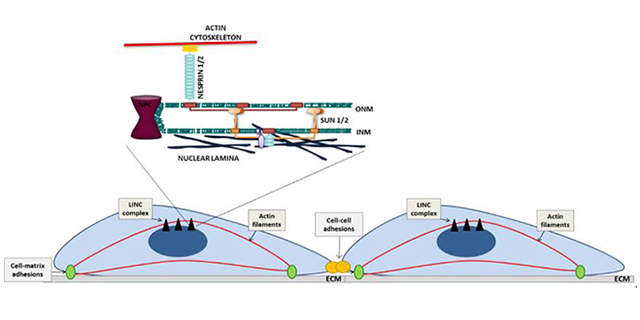 This study addressed the hypothesis that perivascular mast cells regulate neointimal matrix remodelling using a mouse vein graft model. Methods: The impact of mast cells on neointimal remodelling was investigated using mast cell-deficient animals in both normolipidaemic (KitW-sh/W-sh) and hyperlipidaemic (apoE-/-KitW-sh/W-sh) conditions. The effect of perivascular mast cells on vascular matrix remodelling, including collagen and elastin deposition, was investigated using a local mast cell reconstitution method that selectively repopulated mast cells around the carotid artery (where the vein graft was inserted) in KitW-sh/W-sh mice. Results: In normolipidaemic vein grafts (KitW-sh/W-sh vs. the wild type control C57BL/6J), collagen synthesis was not affected by mast cell deficiency at 4 weeks. In contrast, neointimal elastin was reduced by 6.5-fold in mast cell-deficient KitW-sh/W-sh mice, which was prevented by perivascular mast cell reconstitution. 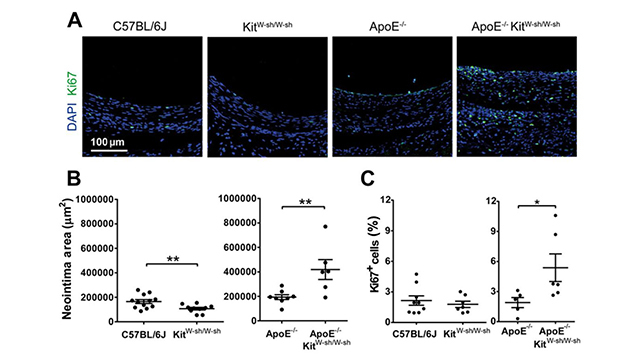 Mast cell deficiency induced a similar reduction in neointimal elastin in hyperlipidaemic mice (apoE-/-KitW-sh/W-sh vs. apoE-/-), with a significant increase in cell proliferation and neointimal area at 4 weeks. Conclusion: Mast cells appear to promote elastin deposition in vein grafts and this may lead to further suppression of cell proliferation and neointimal thickening under hyperlipidaemic conditions. Aim: Bioresorbable vascular scaffolds (BVS) have recently been introduced to minimise the long-term complications of metallic stents in acute coronary syndrome (ACS), but their benefits have not been well analysed. Methods: The authors studied all ACS patients treated with any kind of stent at a single centre between March 2013 (when the first BVS was implanted) and June 2016. Results: The study included 951 subjects, mean age 67.9 ± 13.3 years, mean Global Registry of Acute Coronary Events (GRACE) score 148.5 ± 44.8, 75.2% men and 38.2% with an ST-segment elevation myocardial infarction. The mean number of stents implanted was 1.3 ± 1.0 and 54 subjects (5.7%) received at least 1 BVS. 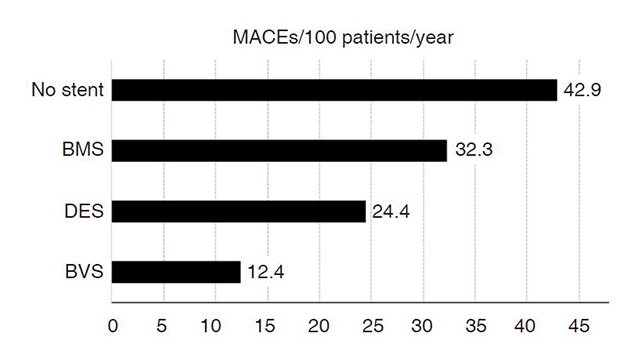 Drug-eluting stents were implanted in 57.3% subjects, followed by bare-metal stents (19.0%). The subjects treated with BVS were younger and had lower GRACE scores compared to the rest. In-hospital mortality was 4.8% and no subject treated with BVS died before discharge. BVS-treated patients received dual antiplatelet therapy or new antiplatelet agents more frequently. During a median follow-up of 13 months, all-cause mortality was 7.8%, cardiovascular mortality was 6.1%, and at least 1 major cardiovascular event occurred in 26.4% of the subjects. Stent type did not affect prognosis. Conclusion: Coronary revascularisation using BVS in selected ACS patients is safe and effective. While vertebral artery injuries are uncommon, they can have significant morbidity if not identified and treated in a timely fashion. While the majority of vertebral artery injuries are the result of blunt injury and typically have favorable outcomes, a substantial percentage of patients with penetrating injury to the neck may also have vertebral artery injury necessitating angiographic or operative intervention. A 45-year-old male sustained a single stab wound to the apex of the posterior triangle of the neck, below the left mastoid process. At the scene, Emergency Medical Services personnel reported large blood loss and upon arrival, his initial vital signs were consistent with Class II/III hemorrhagic shock. Physical examination revealed a 9 cm longitudinal and deep laceration which began to bleed rapidly and profusely during his inital evaluation. The patient was intubated and rapidly transported to the operating room for exploration of the wound with direct control of the suspected vascular injury via suture ligation and application of vascular clips and to interventional radiology suite for embolization. Operative control was necessary however, immediate post-operative angiography allowed confirmation of collateral cerebral perfusion. The patient had an uneventful recovery and was evaluated in the Trauma Clinic during his 7, 14, 30 and 60-day follow-up. Aim: The aim of this pilot study was to compare the heteroplasmy levels of specific mitochondrial (mt)DNA mutations in human buccal epithelial and whole blood cells in participants with different degrees of predisposition to atherosclerosis. The potential for buccal epithelium to be used for the genetic diagnosis of atherosclerosis using mtDNA mutations was assessed. Methods: Samples of buccal epithelial and whole blood cells were obtained from 134 donors. DNA was extracted from the samples and subjected to polymerase chain reaction and pyrosequencing. 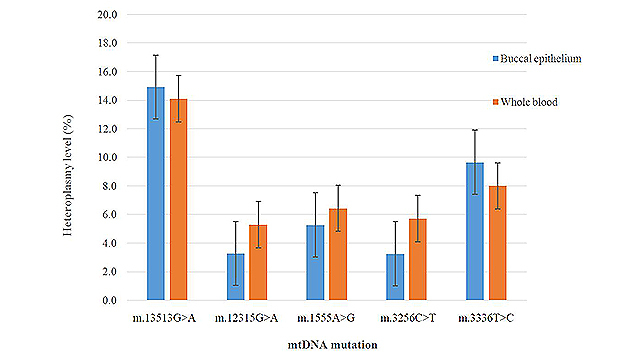 The threshold heteroplasmy levels of the mutations m.12315G>A, m.3336T>C, m.1555А>G, m.13513G>A, and m.3256C>T were analyzed in order to assess the potential for using buccal epithelium and whole blood for the genetic diagnosis of atherosclerosis. 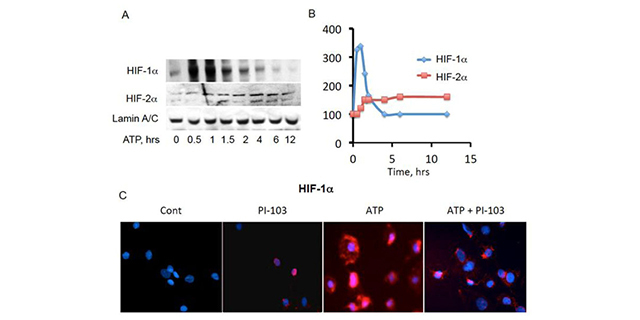 Results: The threshold heteroplasmy levels of the assessed mitochondrial mutations did not significantly differ between buccal epithelial and whole blood cells. Conclusion: Buccal epithelial cells may be preferable to whole blood cells for analyzing the association of mitochondrial genome mutations with atherosclerosis. Early treatment of functional tricuspid regurgitation at the time of mitral valve surgery: an increased risk or an additional benefit? Aim: These experiments studied adipokine and interleukin imbalances during the development and progression of metabolic disorders in patients with arterial hypertension (AH) and type 2 diabetes mellitus (T2DM). 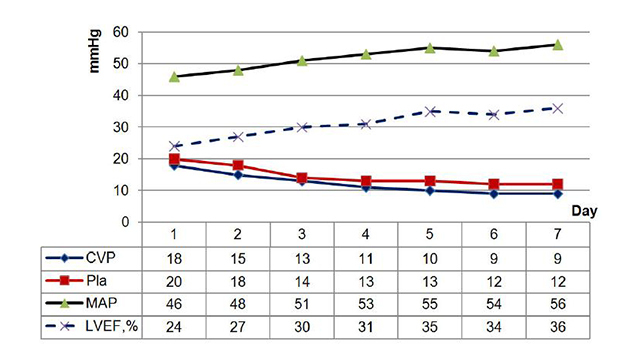 Methods: Ninety-five patients with stage II second degree AH (53 males and 42 females, mean age 54.7 ± 5.4 years) were observed. The cohort was separated into: group 1 (n = 48) patients with AH and group 2 (n = 47) patients with both AH and T2DM. 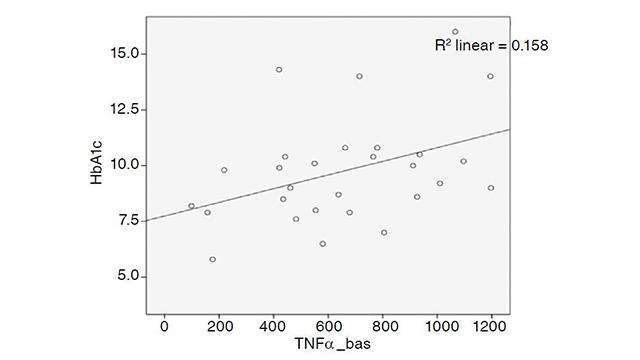 Serum protein levels of omentin, adiponectin, tumor necrosis factor-alpha (TNF-α), C-reactive protein (CRP), resistin, interleukin (IL)-1β, IL-4, and IL-6 were measured. Lipid and carbohydrate metabolism rates were assessed. 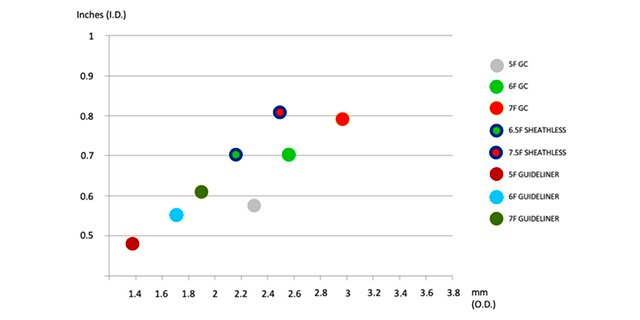 Results: Peak homeostatic model assessment for insulin resistance (HOMA-IR) index values, as well as circulating insulin and CRP levels, were observed in group 2. 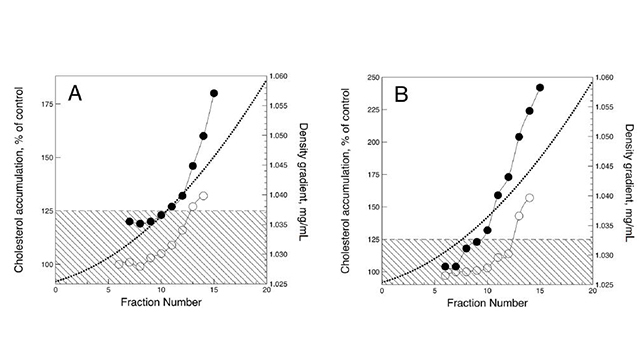 Reduced adiponectin levels negatively correlated with HOMA-IR indices (r = -0.52, P < 0.05), triglycerides (r = -0.52, P < 0.05), glucose levels (r = -0.44, P < 0.05), body mass indices (r = -0.44, P < 0.05), and HbA1c levels (r = -0.57, P < 0.01). Group 2 patients demonstrated low omentin levels and high resistin and TNF-α levels. Negative correlations between IL-6 and both omentin and adiponectin (r = -0.46, P < 0.01; r = -0.42, P < 0.01, respectively) were observed. Conclusion: A novel pathogenic link was demonstrated between metabolic disorders, adipokines, and pro-inflammatory IL-6 levels as negative regulators of comorbid AH and T2DM. We present a case of an aorto-enteric fistula (AEF) with chronic, persistent bleeding from a blind aortic stump managed by endovascular means. This novel approach may have extended the life of a patient who would otherwise have been subject to a high perioperative morbidity or persistent bleeding and death. While our patient ultimately expired, we believe this technique can be considered for temporization in highly-selected patients. The Bjork-Shiley valve has been in use since 1971. Its longevity has been well reported in the literature. The study report a case of the Bjork-Shiley valve implanted in a young man, who presents with bacterial endocarditis 30 years after implantation of the valve. Transthoracic echocardiography showed vegetations in the mechanical tricuspid valve, with positive blood cultures csonfirming the diagnosis. 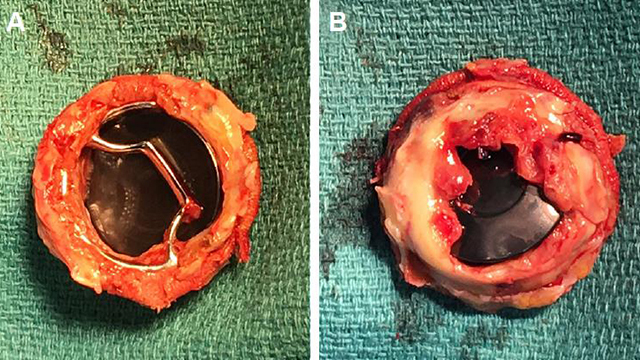 Artificial valves increase the risk of contracting endocarditis but this is the first report of a case of bacterial endocarditis occurring in a mechanical tricuspid valve replacement 30 years after the initial implantation. Aim: Assessment of the possibility of the fixed-dose combination of lisinopril + amlodipine + rosuvastatin (Equamer) to achieve further angioprotection in patients with arterial hypertension and high pulse wave velocity (PWV) despite the previous combination antihypertensive therapy (AHT). Methods: The 24-week open-label multi-center observational study involved 60 patients who received dual combination AHT for 6 months. All patients underwent 24 h blood pressure (BP) monitoring, applanation tonometry (determination of the augmentation index and central BP), measurement of the pulse wave velocity and laboratory tests [blood lipids, fasting glucose test, homeostasis model assessment of insulin resistance (HOMA-IR), leptin, ultra-sensitive C-reactive protein (us-CRP)] before and after switching to the fixed-dose combination of lisinopril + amlodipine + rosuvastatin (Equamer). Results: According to the office BP measurements, switching the patients from the dual combinations to the fixed-dose combination of lisinopril + amlodipine + rosuvastatin has resulted in a further decrease of 14.3% in systolic BP (SBP) and 18.5% in diastolic BP (DBP). According to the 24 h BP monitoring data, the SBP has decreased by 16.1% and the DBP by 21.8%. The combination of lisinopril + amlodipine + rosuvastatin has reduced the SBP by 14.4%, the augmentation index by 14.5% and the central SBP by 8.1% (P < 0.01 vs. baseline). 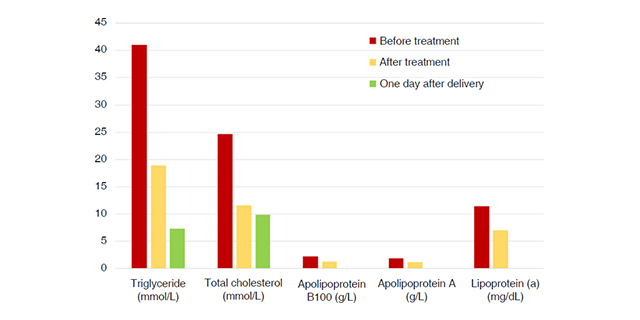 The fixed-dose combination of lisinopril + amlodipine + rosuvastatin has provided a 44%-decrease in low-density lipoproteins, a 36.1%-decrease in triglycerids and a 10.3%-increase in high-density lipoproteins (P < 0.01 vs. baseline). The use of the fixed-dose combination of lisinopril + amlodipine + rosuvastatin has provided a definite decrease in the insulin resistance, as well as levels of us-CRP and leptin. Conclusions: The fixed-dose combination of lisinopril + amlodipine + rosuvastatin provides improved BP control, better vessel elasticity indicators (augmentation index, PWV, central BP), boosts the lipid and carbohydrate metabolism and helps to reduce the inflammation and leptin resistance in patients who initially received a dual combination AHT. Aim: Renin, a component of the Renin-Angiotensin-Aldosterone System (RAAS), is produced in the juxtaglomerular cells of the kidney. It is an important factor for the regulation of blood pressure and electrolyte balance and encoded by the REN gene. Recent studies suggest that the RAAS is a regulator of kidney functions. Individuals with REN variants have been associated with high blood pressure. We substantiated the hypothesis that genetic variants of REN gene have significant association with prevalence of nephropathy and in the development of nephropathy in type 2 diabetes mellitus (T2DM). Methods: We enrolled to the study 718 consecutive subjects who were registered patients in two individual hospitals in Kolkata city, India. They consisted of 246 (34.26%) T2DM patients without nephropathy cases, 168 (23.40%) type 2 diabetes with nephropathy cases (T2DNH) and 304 (42.34%) healthy controls. 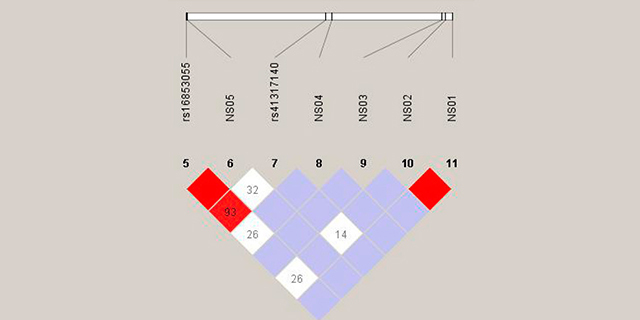 Genotypes were assayed with genomic DNA for two known variants of the REN gene, i.e., rs16853055 and rs41317140 using sequencing methods. Results: Association between the REN gene variants and prevalence of T2DM and T2DNH was tested. A significant association of T2DNH and variant rs41317140 was obtained and it was evident that the rs41317140 (C>T) shows a significant difference between T2DM and T2DNH (X2 = 4.92; P = 0.03; OR = 0.6162; 95% CI: 0.4006-0.948). The results from the multiple model test that additive model predicted the association at genotype level and shows a significant difference between T2DM and T2DNH (OR = 0.6067; P = 0.03). There was no significant association between T2DNH or T2DM and variant rs16853055. Conclusion: Thus, it is concluded that a genetic variant of the REN gene should have a significant impact on the onset of type 2 diabetic nephropathy. Most of axillo-subclavian artery injuries are due to violence. Iatrogenic injuries to such vessels are relatively rare. We hereby present the first report of pigtail catheter insertion for right upper chest wall hematoma drainage resulting in penetration of axillary artery and pseudoaneurysm formation. A 39-year-old male victim of motor vehicle accident developed right upper chest wall hematoma after initial conservative treatment. Subsequent admission was arranged and pigtail catheter drainage was performed under sonography guidance. 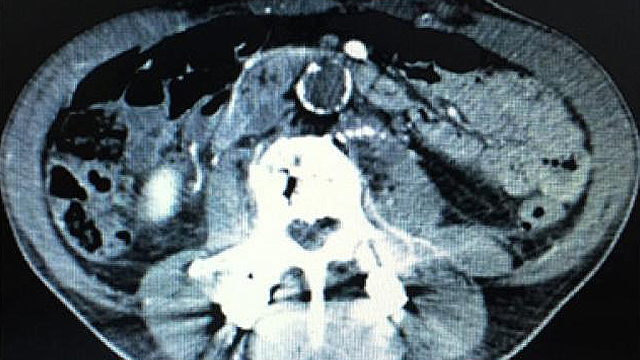 The procedure caused penetrating injury to his right axillary artery with pseudoaneurysm formation. Endovascular repair and stent placement were performed. The patient was discharged within 2 weeks without significant sequelae. Non-catheterization procedure caused penetration of axillary artery was rarely seen in published reports. 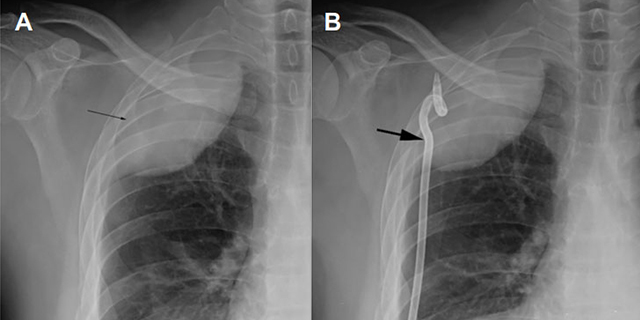 Our report described a case of axillary artery penetration resulted by pigtail catheter insertion which was never seen. We wish to emphasize on the jeopardy of non-vascular procedure on penetrating nearby vessels because of anatomical proximity. Hypertension remains a leading risk factor of cardiovascular (CV) events and disease in the general population. The prevalence of hypertension is present in developed and developing countries and according to various assessments may fluctuate between 30% to 90% with considerable regional differences. Hypertension influences CV risk and mortality rate through target organ damages that affect vasculature particularly endothelium. Endothelial dysfunction is an independent risk factor of CV complications. Recent studies have shown that a decreased number and altered function of circulating endothelial progenitor cells (EPCs) may be a powerful marker of endothelial dysfunction with possible predictive value. 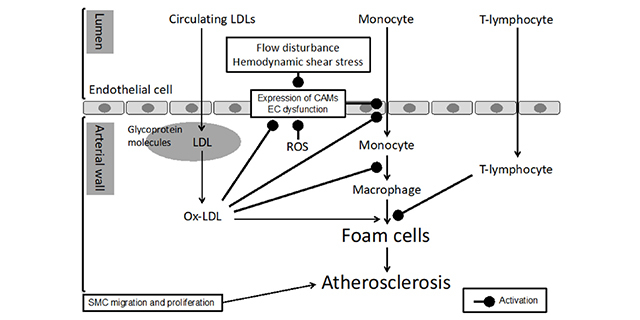 The aim of this review is to update the current evidence of the role of endothelial progenitor cell dysfunction in impaired vascular reparation and CV risk in hypertension. The review discusses the interrelation between EPC dysfunction and traditional CV risk factors, such as hypertension, dyslipidemia, obesity, prediabetes/diabetes mellitus. It has been speculated that EPC dysfunction could appear prior to hypertension and represents an appropriate hypertensive phenotype with exaggerated CV risk. However, the predictive value of EPC dysfunction in hypertensive patients is not established and requires to be investigated in large clinical controlled trials. 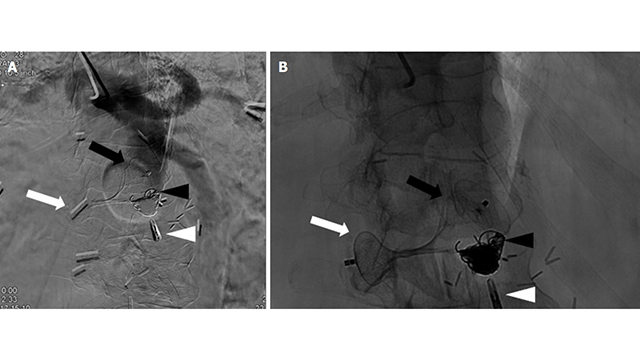 We present a case of a superior mesenteric arteriovenous fistula (SMAVF) diagnosed four years after index Nissen fundoplication and examine the associated imaging, clinical course, and surgical treatment followed by a review of the limited, available literature. 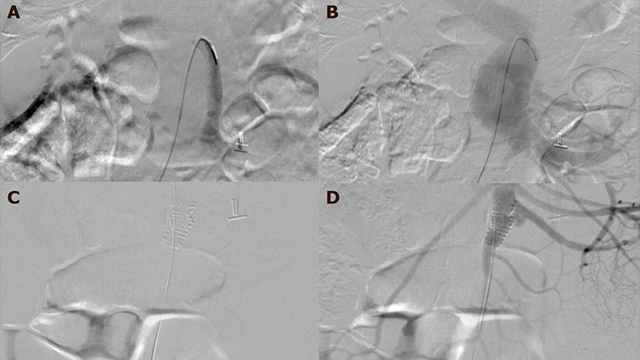 From a transbrachial approach, a covered stent was successfully deployed in the superior mesenteric artery to exclude the fistula after confirmation of the site of pathology on both digital subtraction angiography and intravascular ultrasound. Follow-up imaging demonstrated continued exclusion of the anomalous fistula with complete resolution of his symptoms at both his postprocedure and 1-year follow-up visits. SMAVFs are usually encountered secondary to previous surgical dissection or trauma and presents with nondescript abdominal pain making early diagnosis difficult; however, they can be successfully treated with minimally-invasive stent exclusion. Aim: The aim of the study was to perform a comparative evaluation of the use of various methods of reconstructive assistance in the repair of the femoral-tibial segment in patients with peripheral arterial disease. Methods: Two hundred and fifty-three patients with atherosclerotic lesions of arteries below the inguinal ligament were examined and revascularized. According to the type of reconstruction performed, the patients were divided into 3 groups: 98 patients underwent open operative interventions; 116 patients underwent endovascular interventions; 39 had hybrid reconstructions performed. Results: Minor blood loss, and stability of hemodynamics in the perioperative context positively characterize hybrid effects. The time spent in the resuscitation department and the shorter hospitalization of patients after hybrid revascularization methods were revealed in comparison with open methods. The absence of dangerous complications and the primary patency of the operated segment in the early postoperative period, approaching 100%, characterize hybrid techniques as an effective method of treating patients with infrainguinal arterial disease. Conclusion: Hybrid technologies are characterized by a shorter duration of surgical intervention, a low amount of blood loss and a lower incidence of complications in the early periods. 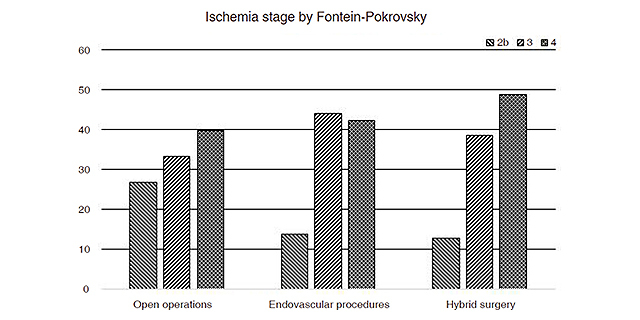 The primary patency of the operated segment after hybrid techniques was higher than after open and endovascular surgical interventions. Aim: This paper aims to evaluate the effectiveness of MitraClip implantation as a solution to severe mitral regurgitation (MR) in the case of posterior leaflet prolapse due to hypertrophic obstructive cardiomyopathy and chordae rupture. Methods: NX CAD software was used to create a surface geometric model for the mitral valve (MV). A hyperelastic material model, calibrated against experimental results, was used to describe stress-strain responses of the MV leaflets, and a spring element approach was used to describe chordae response. Abaqus CAE was employed to create a finite element model for diseased MV suffering from MR. The effectiveness of MitraClip implantation on valve function was investigated by simulating the deformation of diseased valve, with and without MitraClip repair, during peak systole and diastole. 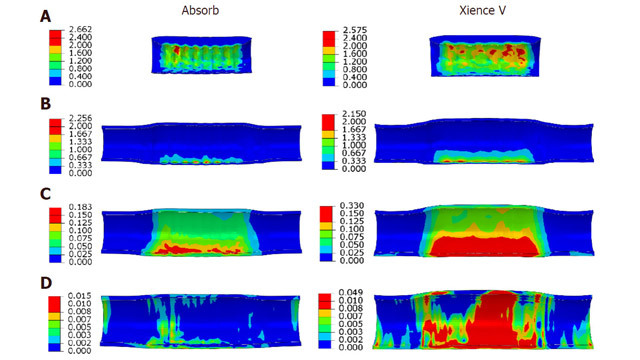 Leaflet deformation and stress distributions were used to assess the effectiveness of the procedure. Results: Overall, significant improvement was achieved for the diseased valve after MitraClip implantation. 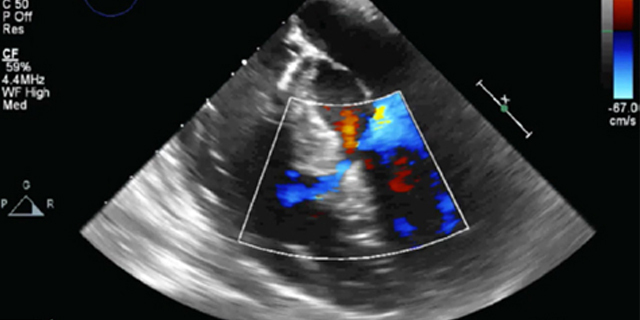 Prior to the introduction of the clip, the diseased valve was subjected to posterior leaflet prolapse which would induce a jet of MR. Once the MitraClip was included in the simulation, the valve leaflets were able to close and seal off, almost entirely at peak systolic condition without a significant impact on the stress distribution of the valve leaflets. Conclusion: The results in this study provide further evidence to support MitraClip repair as a viable treatment for high-risk patients suffering from severe MR, and also highlight the need for further research into such an advanced, minimally invasive surgery technique.